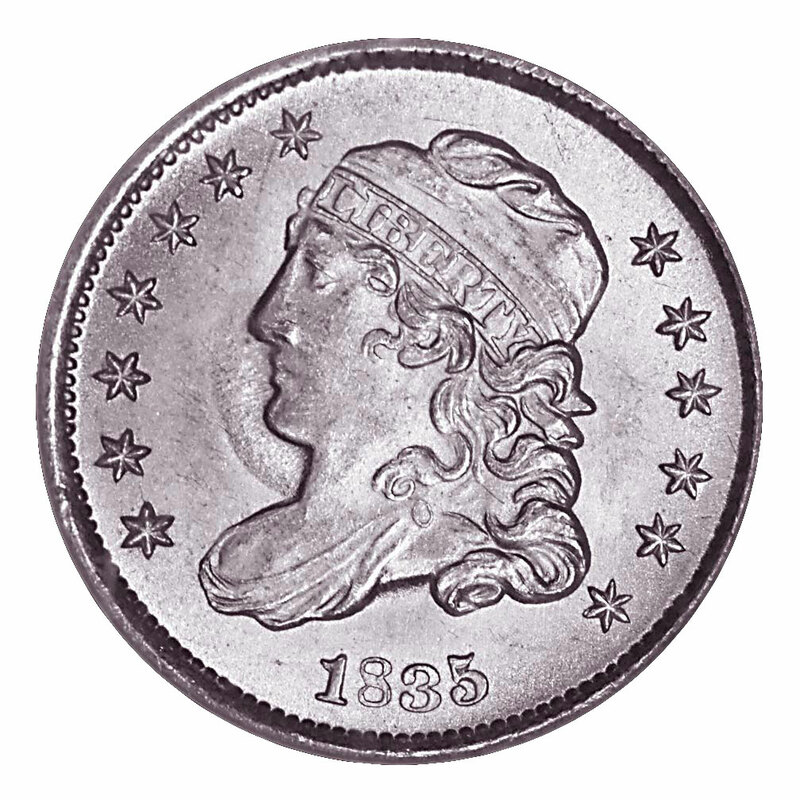 The half dime was not a very popular denomination during the early years of the United States Mint. Its production was erratic and small, since depositors of silver bullion at the Mint typically requested larger denominations. (In circulation, the place of the half dime was usually taken by the medio, or Spanish half real piece. 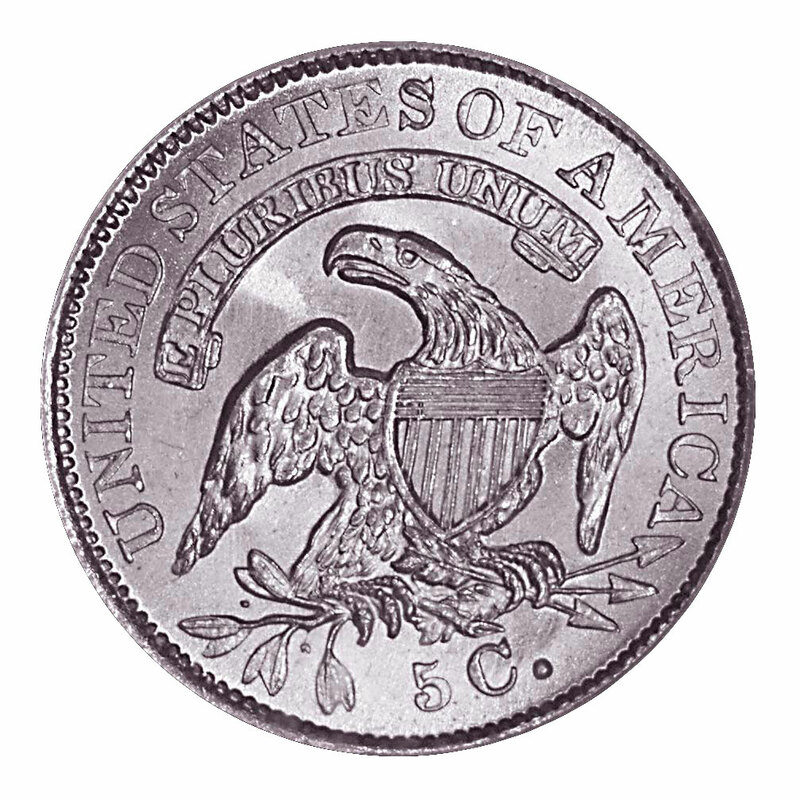 Though it carried a legal tender value of 6-1/4 cents, the half real was sometimes discounted to five cents when heavily worn). The coining of half dimes was suspended after 1805. When minting eventually resumed in 1829 this denomination featured William Kneass' interpretation of the Capped Bust Liberty and heraldic eagle, originally designed by John Reich in 1807. Though still struck by manpower, the new half dimes were coined within a close collar, which gave them a uniform diameter and distinct, raised rims. 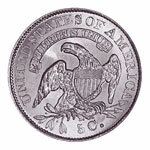 This series continued until 1837, when it was replaced mid-year by the Seated Liberty type. The grading of Capped Bust half dimes is relatively simple for circulated pieces. In the higher circulated grades, weakness of strike may be confused with wear, so it is good to know where such weakness typically appears. This information may be found within the book The Official American Numismatic Association Grading Standards for United States Coins. Included in it is the following cautionary note: "Coins of this design are sometimes weakly struck, particularly in the drapery, clasp, hair, motto above the eagle, and wings close to the shield." In addition, certain varieties in this series exhibit die breaks which affected their wear patterns; the broken portion of the die wore rapidly, while simultaneously acting as a shield against wear for the portions immediately adjacent to the break. This can be quite confusing to a person viewing such a coin for the first time, but it is a natural phenomenon of the minting process. Aside from these considerations, the text and photographs found within the ANA's grading book provide an accurate guide to grading worn examples of this coin type. 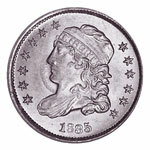 Like most of our early coins, the Capped Bust half dime is relatively scarce in truly mint state condition. Years ago, any coin that appeared lustrous was typically cataloged as "Uncirculated," though most exhibited some slight rubbing or luster loss on their highpoints. The advancement of coin values, combined with the growing usage of third-party grading services, has largely eliminated such would-be mint state coins. Within the mint state grades, however, there is a wide variance in quality. Surprisingly, there are a fair number of gem pieces known. The dates which seem to be the most available in top grades are 1831, 1832 and 1835, while 1837 has proven to be the most elusive in both the overall numbers certified and the prevalence of high-grade examples. Some of the detractions which can cause a mint state Capped Bust half dime to be downgraded from the gem (MS-65 and higher) classification include numerous or particularly noticeable marks, dull luster, a very poor strike and unattractive toning. Other flaws can preclude a coin from being certified at all by the major grading services. Whether a coin is mint state or circulated, signs of damage, alteration to its surfaces or harsh cleaning usually will result in such pieces being returned to the submitter without a grade and encapsulation. The grading service typically will attach a sticker to the envelope explaining in brief why that particular coin was rejected. Other grading services will still certify such coins at a somewhat diminished grade, though with a qualifier such as "CLEANED" or "DAMAGED" included on the label. Proofs exist for several dates in the Capped Bust half dime series. These are very rare, and their grading is beyond the scope of this column. Collectors will find pleasure enough in pursuing this charming coin by type, date and, for the truly adventurous, die variety.